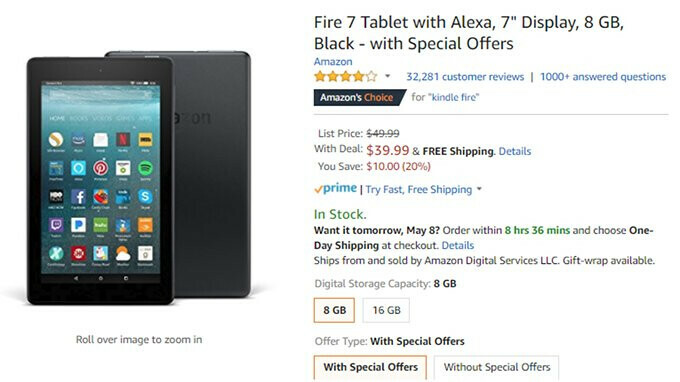 Amazon's Fire series tablets are probably among the cheapest Android slates available on the market. The 7-inch model even received the Amazon's Choice tag for highly rated, well-priced products available to ship immediately. Aside from the great price, all three Amazon Fire tablets come with Alexa integration, which makes them even more valuable. If you've always wanted to give them a try, you'll be pleased to know that Amazon has them on sale for a limited time. Amazon Fire 7 and 8 come in four color versions (Black, Canary Yellow, Marine Blue, and Punch Red), while the Fire 10 is available in three color variations ( Black, Marine Blue, and Punch Red). There's one caveat though, as all three deals are available via Special Offers, which means that you'll receive Sponsored Screensavers and special offers from Amazon directly on your tablet. These will be shown as a screensaver when your device is in sleep mode.